The Lord Mayor is a representative of all residents of Armagh City, Banbridge and Craigavon Borough. Therefore, during his/her term of office, the Lord Mayor will seek to accept invitations from all sections of the community. Every endeavour will be made by the Lord Mayor’s Office to ensure the Lord Mayor’s visit to your function is a success. You are more than welcome to contact the Office, where appropriate advice and assistance is readily available. The Lord Mayor of Armagh City, Banbridge and Craigavon usually attends a high number of engagements during the Civic Year and each event is processed by the Lord Mayor’s Office. In view of the Lord Mayor’s busy schedule, it is preferred that each invitation is put in writing to the Lord Mayor’s Office with as much notice as possible prior to the date of the event. Upon the Lord Mayor’s acceptance of an invitation, the Lord Mayor’s Office will contact you to find out details of your event and if there are any duties for the Lord Mayor to perform while present. The following are guidelines which may prove helpful when you have invited the Lord Mayor to your event. Please remember that the Lord Mayor is the first citizen of Armagh City, Banbridge and Craigavon and should be afforded every privilege as such. The Lord Mayor’s Secretary must be told at what time you would like the Lord Mayor to arrive at your event, where he/she should be met by the host i.e. Chairman/President/Leader of your group/organisation, and escorted by such a person into and throughout the event. That person should then make any necessary introductions to other organisers/office bearers or special guests present. When addressing the Lord Mayor the correct term is “Lord Mayor”. The Lord Mayor should be accompanied by the host of the event at all times, this includes being guided around the event or seated next to at a concert. If refreshments are served, it is usual that the Lord Mayor would take precedence. Should the Lord Mayor have a participating role in your event, the Lord Mayor’s Secretary should be informed well beforehand. For example, a speech to make, a trophy to present, a ribbon to cut etc. The Lord Mayor will know from his/her briefing exactly what is required from him/her, but you, as the organiser, should confirm all the details with the Lord Mayor before your event begins. PRECEDENCE – The Lord Mayor has precedence inside his/her own council area, that is, the Lord Mayor should walk first, be announced first, should be spoken to/introduced first etc. The Lord Mayor surrenders precedence only when the Lord Lieutenant is present in his official capacity representing the Queen. It goes without saying that the Lord Mayor will give precedence to Her Majesty the Queen and Members of the Royal Family. Unless the Lord Mayor occupies the Chair at a gathering, he/she should be seated on the immediate right of the Chairman. If a speech is required from the Lord Mayor it is usual that the Lord Mayor would speak first. The Lord Mayor and Lady Mayoress/Consort should always should always be seated on the platform or at the top table. At the conclusion of your event, when the Lord Mayor is leaving, he/she must be escorted to either the door or outside to the Mayoral Car. 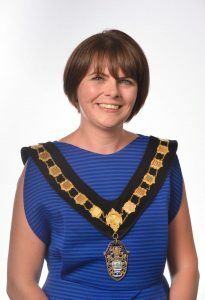 When a male Lord Mayor is in office, then his spouse/partner is known as the Lady Mayoress of Armagh City, Banbridge and Craigavon and should be addressed as “ Lady Mayoress”. When a female Lord Mayor is in office, then her spouse/partner is known as the Lord Mayor’s Consort and should simply be addressed as Mr. The Lady Mayoress or Lord Mayor’s Consort should be treated with the same courtesy as the Lord Mayor when accompanying him/her to an event. In the absence of the Lord Mayor, the Deputy Lord Mayor is entitled to the Lord Mayor’s right of precedence within the council area and similar arrangements to those listed earlier in this booklet should be made if the Deputy Lord Mayor is attending a function in place of the Lord Mayor. 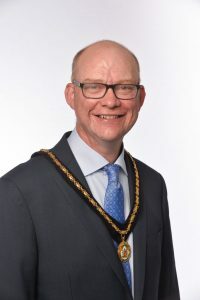 It is in order for the Lord Mayor to wear the Chain of Office on all occasions when acting in an official capacity, following the amalgamation of Armagh, Banbridge and Craigavon Council’s the Lord Mayor of the day will choose his/her preferred chain of office from the three available of the legacy Councils. It is in order for the Lady Mayoress to wear the Chain of Office when accompanying the Lord Mayor to official functions. The Deputy Lord Mayor’s Chain can be worn when the Deputy Lord Mayor is deputising for the Lord Mayor at official functions. If the Deputy Lord Mayor is present at a function at which the Lord Mayor is also present and wearing his/her Chain of Office, it is not permitted, that the Deputy Lord Mayor also wears his/her Chain. This decision can be made when consideration is given to type of function and whether or not the organisers would wish both the Lord Mayor and the Deputy to be chained. A Lord Mayor may decide to support one/two particular chosen Charities during his/her term in Office, or may decide to support as many different Charities as possible.